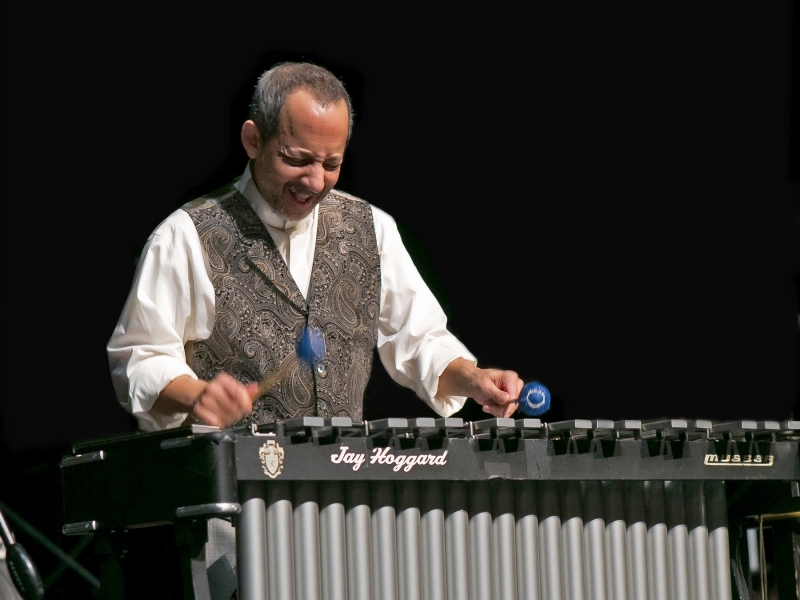 Vibraphonist Jay Hoggard's music has touched the hearts and souls of listeners around the world for thirty years. Noted journalist Owen McNally wrote "Jay Hoggard's artistry has a universal quality, an intellectual and emotional resiliency that makes it seem very much at home when creating something new and fresh in every genre from the roots of African music to the outer reaches of the blues ....He is not just one of the premier voices on vibraphone but also one of the top-seeded instrumentalists and composers of the jazz world today." Jay Hoggard draws on traditional and contemporary musical vocabulary to develop new directions for the vibraphone. Jay 's music is positive, spiritual, uplifting and happy. He seemlessly blends jazz and gospel roots with African marimba rhythms. His performance repertoire represents the three B's of the jazz tradition (Blues, Bop, Ballads) with original innovations. Songs and extended compositions frame his virtuoso mallet improvisations. Jay Hoggard has recorded 21 CD's as a leader and over 50 as a collaborator. His latest disc, SOLO FROM TWO SIDES, released August , 2009, is a beautiful program of 13 Jay Hoggard compositions performed by the composer on both vibraphone and marimba, by way of digital overdubbing. Born in Washington, DC, Jay Hoggard was raised in Mt. Vernon, New York in a religious family. At age 15, Jay began playing the vibraphone. "One night I had a dream that I was playing the vibes. I asked my father to rent me a set and from the first moment, I knew that this was what I was supposed to do." Jay majored in the renown World Music program at Wesleyan University . He toured Europe and played at Carnegie Hall during his freshman year. In his junior year, he traveled to Tanzania to study East African xylophone music. After graduation in 1976, Jay returned to New York City where he was proclaimed "the most dazzling new vibraphonist in jazz" by Robert Palmer in the New York Times. Jay Hoggard has been honored and commissioned as a composer in various contexts. In 2009, he was commissioned by dance troupe Sankofa Kuumba and the Hartford Symphony Orchestra to write THE OTHER SIDE OF THE OCEAN and LET ME MAKE IT CLEAR. Previously, Jay collaborated with choreographer Cleo Parker Robinson by composing THE WISDOM OF THE BAOBAB TREE commissioned by Lincoln Center Out of Doors. He was commissioned by the Hartford Festival of Jazz to compose LA TIERRA HERMOSA, dedicated to Tito Puente. He was commissioned by Wesleyan University to compose JOYFUL SWAMP and CROSSING POINT for Max Roach and percussion ensemble, and VIBARIMBALA for symphonic and jazz orchestras. As a performer, Jay Hoggard has toured the globe to rave reviews. He has performed in many of the finest venues of music presentation throughout the United States , Africa Europe, South America, the Caribbean, and Asia. Jay has performed in major venues (Kennedy Center, Lincoln Center, Schomberg Center) jazz festivals (St. Lucia. JVC, Montreux, Mt.Fuji, Pori, Hartford), colleges, universities, churches, galleries, libraries, and clubs around the globe. Jay has been featured on radio (NPR, Pacifica) and television (ABC Times Square, CBS Sunday Morning, BETJazz) nationally and internationally. He led a quintet on an extensive tour sponsored by the United States government to North Africa, the Middle East and India. Jay performed in special concert collaborations with vibraphone masters Lionel Hampton, Milt Jackson, Tito Puente and Bobby Hutcherson. He has recorded and toured with creative artists such as Kenny Burrell, Dr. Billy Taylor, James Newton, Hilton Ruiz, Oliver Lake, Bennie Maupin,Sam Rivers, Anthony Braxton, Jorge Dalto, Terumasa Hino, Dwight Andrews, Geri Allen, Anthony Davis, Henry Threadgill, Vishnu Wood, Chico Freeman, Muhal Richard Abrams , Sherry Winston, Ahmed Abdullah, and was a guest artist with the Dizzy Gillespie Big Band. Jay has accompanied singers, instrumentalists, and poets and has performed with gospel, theater, dance, percussion, and orchestral ensembles. For the past 18 years, Jay Hoggard has been director of the Wesleyan University Jazz Orchestra, where he has taught and mentored hundreds of students. Jay has been married for over twenty years to Donna Dinkins Hoggard,a public health professional. They have two children.